WordPress widgets give the developer a tool to create functionality for the site. 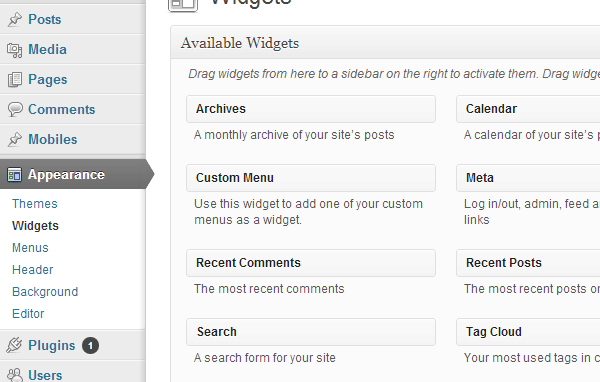 Then these widgets can be displayed on any widgetised area of the theme by the site admin. These widgets can have a wide variety of functionality from displaying static text to complex operation like logging into some external system and fetching information from there. WordPress provides good infrastructure to create widgets easily by abstracting the things required for a widget to function within WordPress and so that the developer can concentrate on coding only the functionality of the widget. The widget can also have options defined to customize the behavior of the widget. The WordPress admin can also add two different instances of the same widgets either in the same or different widgetised area of the theme. In this article we are going to see how the admin can drag drop the widgets and how can we develop a WordPress widget with options. You can easily drag drop any one of the widgets on the widgetised areas shown on the right and then add the settings. Below I am going to drag drop the text widget and add some settings to it so that it will be seen in the sidebar. Let’s start by creating our first WordPress widget. 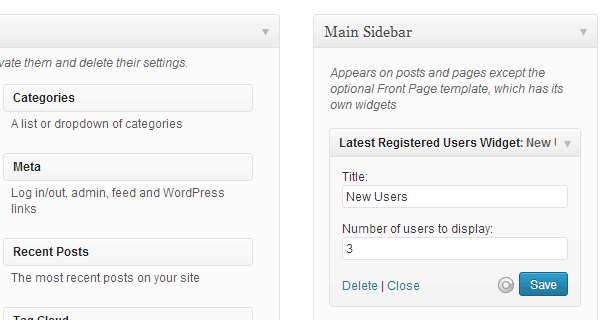 In this widget we are going to show the latest registered users of your WordPress site. To create a widget in WordPress you have to create a class which will derive from WP_Widget which provides the functionality to create a widget. In the above code we have created a class Latest_Registered_Users_Widget which derives from WP_Widget and it then overrides some of the functions. We will see the details of the function below in the article, for now we can just have a blank implementation for them. In the constructor we call the constructor of the parent class WP_Widget in which we pass the arguments the id of the widget (this must be unique), the name of the widget (this will be displayed on the configuration page), and the widgets options in which we pass the description of the widget. With this our basic structure of the widget is complete. Once we have completed the basic class of our widget we can register it with the WordPress system so that it will be seen in the widgets list in the WordPress admin and it can be dragged & dropped on the widgetised area. In this you are basically hooking to the widgets_init hook of WordPress and then calling register_widget function on our widget. You can even drag & drop you widget on a widgetised area. Once we have got our widget registered now let’s add some options to our widget. To add options to our widget we have to add code to our form function. The argument to this function is the instance variable which holds the values for the current instance of the widget. In this function we check if the title and number of user’s values has been set (by a previous update done) by the admin. If they are been set then we will display those values or otherwise we will display the default values which we have defined. Once that is done we add the label and text field for the two options using the functions get_field_id and get_field_name which help to generate the id and name for an option. Once we have displayed the widget options the user can change the options and can click on save. We have to implement the update function to update the widget options. In this we get the arguments and the instance as arguments to the function. Then we get the title and display it on the screen. Then with the help of WP_User_Query I get the latest registered users. I limit the number of users by the number selected in the widget option. 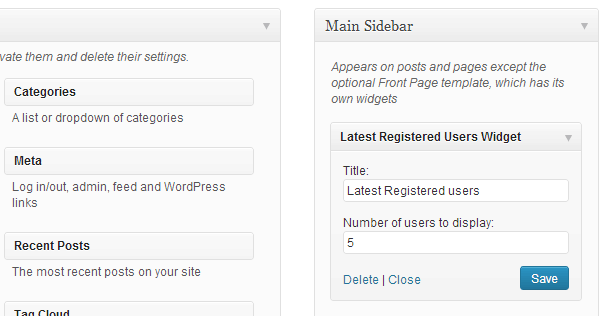 Widgets in WordPress make it very easy for the site admin to add functionality where he wants in his theme. Some themes have a lot of widgetised areas so that a lot of widgets can be used on them. 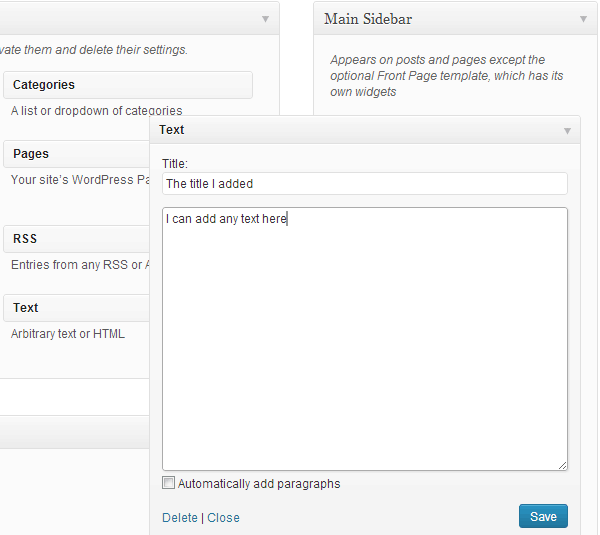 WordPress also makes it very easy and quick to develop new widgets. So have fun while creating your next WordPress widget. Very nice, quick and dirty tut. I learned a lot because you explained it very nicely. Best of luck, super coding dude. Nice post. WordPress widget plugins are heavily used in themes to allow users to add content in a flexible way without any need for coding.